Sightline is available at sightlinevis.com, and you can click the link there to install the sightline chrome extension. 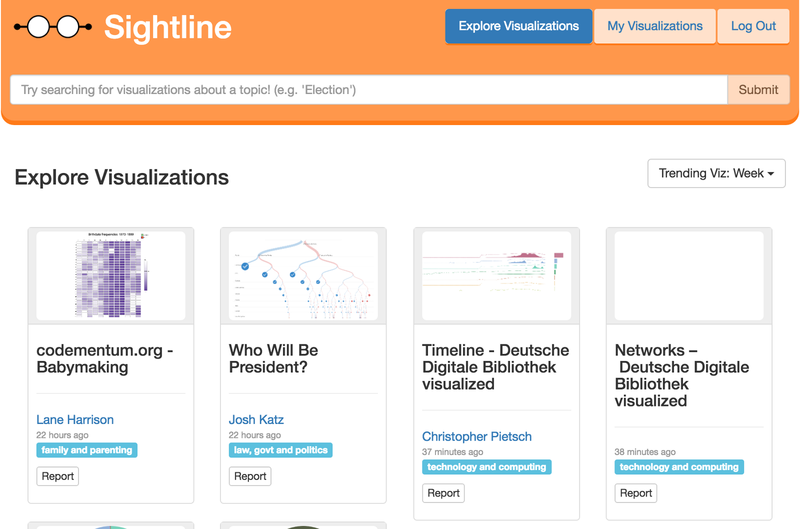 Sightline is an automatic data visualization collection and discovery service that leverages the rich visualization ecosystem of the internet and puts it in one place. For any given topic on the internet, there exist many datasets and visualizations. Try googling “2016 Election”, for instance, and you’ll find a visualization of the likely U.S. party nominees waiting for you right at the top of the page, courtesy of google, using data from AP. Immediately below that you can find Nate Silver and the team at fivethirtyeight.com’s “2016 Election Forecast” page, which holds a hugely complex interactive visualization of each candidate’s chances in November. Continue down the first page of google and next you’ll find a page with many more visualizations by Wilson Andrews and Josh Katz at the New York Times. Data is being visualized in new and interesting ways all the time. Communities like Reddit’s /r/DataIsBeautiful create and post new visualizations constantly. Each of these visualizations exist separately from one another. Even visualizations which share a topic are rarely collected together. We built Sightline to help solve these problems. Why should I install Sightline? We envisioned Sightline originally as a browser history, but better, and limited to interactive data visualizations, so that a user could, for example, find the visualization he viewed a while ago but didn’t save. The good news is that this functionality is still a core part of Sightline. 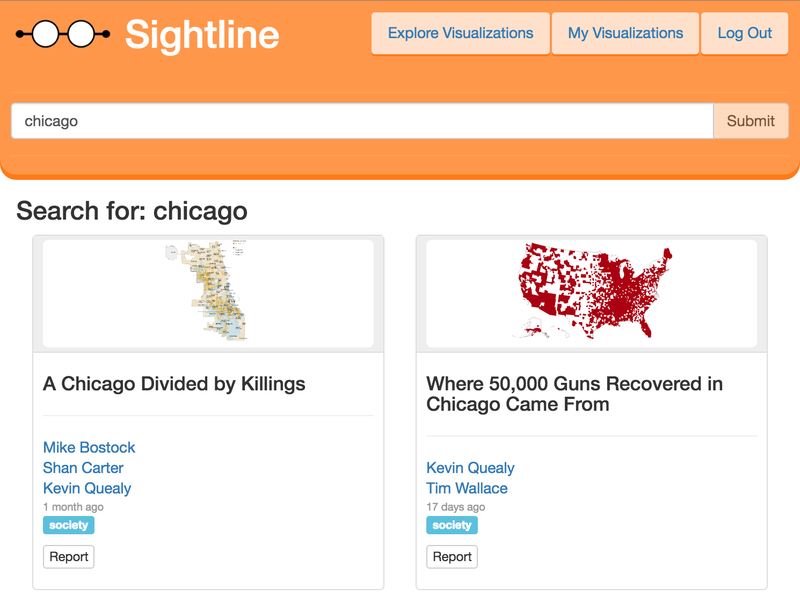 We provide a personal visualization browsing history for each user of Sightline. We can use all of that data to provide a visualization discovery service. Currently, it is structured to show “Trending Visualizations” over a certain time period, where visualizations that have been visited by the most people within that time period are ranked highest. In the future we’d like to draw further connections between all the visualizations, and recommend visualizations similar to the one you’re already looking at. We also aggregate all of the browsing data to provide a search feature, so that, for example, any user of Sightline can search for “election” and find many of D3 visualizations connected to the upcoming election. Who built Sightline and how do I get it? Sightline is research project I’ve been working on this summer at Bucknell University, with my advisor Evan Peck, in collaboration with Lane Harrison at Worcester Polytechnic Institute. You can install sightline easily by visiting our site, sightlinevis.com, and clicking the “Download Our Chrome Extension” button. Once the extension installs, click its icon, and log in with a google account. Thats it! Sightline couldn’t have been made 5 years ago, because today the D3 visualization toolkit has almost complete ubiquity. Almost every interactive visualization on the web uses D3 to build the SVG the users interact with, or draw on a browser canvas element. Sightline takes advantage of how ubiquitous D3 is by detecting its use on a page as a marker for there being a visualization on the page. To do this, we use a Google Chrome browser extension whose sole purpose is to look for D3 on pages the user visits, and submit a thumbnail image of the largest SVG on the page to our Sightline server. Once we receive the thumbnail on the server, we make several requests to IBM Watson’s AlchemyLanguage API, which provides us with keywords, concepts, titles, authors, and categories for each of the URLs for our visualizations. We then use this metadata to power our visualization search. What about my privacy? Is my data kept safely and privately? You bet! Sightline stores personal data like browsing history visits separately from the data about each visualization. Nobody but you can view your browsing history, and you have complete control over it. You can delete individual history entries. Can I blacklist certain domains? Yup! localhost is automatically blacklisted, and to add a site to the blacklist, just open the options menu from the chrome extensions page and hit submit. Sightline is available at sightlinevis.com, and you can click the link there to install the sightline chrome extension. User authentication is handled by logging in through google.